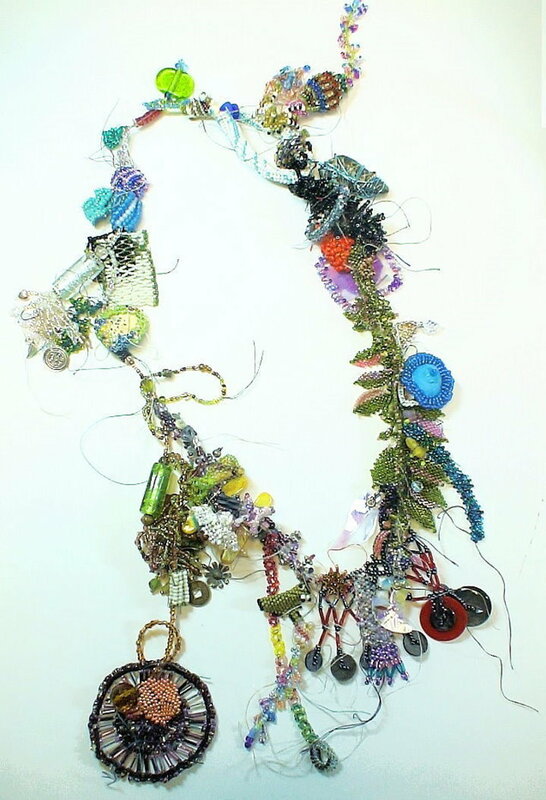 Land of Odds, Be Dazzled Beads, The Open Window Gallery, and The Center for Beadwork & Jewelry Arts are proud to announce the Winner and Runner-Up in this year’s The Ugly Necklace Contest! These two contestants have succeeded in creating necklaces which were hideous, using clever materials, fashioning a creative clasp assembly, and showing a strong degree of artistic control in their jewelry-making endeavors. Doing something “Ugly” is easier said, than done! These beadwork and jewelry artists have demonstrated their commendable design skills. They have been judged, from among entrants from across America, Great Britain, and Canada by a distinguished panel of four judges from The Center for Beadwork & Jewelry Arts in Nashville, Tennessee, and voted on by visitors to the Land of Odds web-site. To view additional images of the necklaces submitted by the winner, runner up and the other semi-finalists of the 7th Annual 2009 The Ugly Necklace Contest, please visit us at www.landofodds.com/store/ugly7contest.htm on-line. Entries for the Eighth Annual 2010 The Ugly Necklace Contest will be accepted between September 1st, 2009 and March 15th, 2010. For official rules, and 2010 special requirements, please visit our web-site at www.landofodds.com/store/uglynecklace.htm . And if you are in the Nashville area, please stop by Be Dazzled Beads, where the 6 selected Ugly Necklaces are on display through September 15th. The Ugly Necklace Contest is one of the programs of The Center for Beadwork & Jewelry Arts in Nashville, Tennessee, to encourage beadwork and jewelry makers to test their design skills, push the envelope, and learn some fundamentals about jewelry design in the process. Semi-Finalists Announced – Voting Begins! Six Jewelry Artists from around the world have been selected as Semi-Finalists of The 7th Annual 2009 The Ugly Necklace Contest – A Jewelry Design Competition With A Twist, by a panel of four judges from The Center for Beadwork & Jewelry Arts and Land of Odds. Voting begins On-Line on May 27th, thru July 15th for the Winner and Runner Up Grand Prize: $992.93 shopping spree on Land of Odds web-site (www.landofodds.com ) Runner Up Prize: $399.07 shopping spree on Land of Odds web-site. So the many jewelry designers from across America and around the Globe who entered our 7th Annual 2009 The Ugly Necklace Contest, found this contest especially challenging. After all, your brain is pre-wired to avoid and reject things which are ugly. Think of snakes and spiders. And even if you start your necklace with a bunch of ugly pieces, once you organize them into a circle, the very nature of an ordered round form makes it difficult to achieve Ugly. Yes, “Ugly” is easier said than done. Does our Minnesota entry make even lung cancer look pretty? Or does our entry from Ohio give the four seasons a bad name? Surely, our Oregon entry didn’t mean to step on and crush all the flowers in her garden. Nor did our entry from Washington intentionally put down anyone with a sweet tooth or an obsessed passion for the fork. From Maryland comes this perplexing challenge: can Trash be Ugly? We would assume so, until we try to make a necklace from it. And from England, another kind of trash – bead project trash – comes to signify what ugly things happen when you don’t finish what you started. Now it’s time for America and the World to help finalize the decision about which of these 6 semi-finalists’ Ugly Necklaces to vote for. The winner will truly be an exceptional jewelry designer. The losers….well….this isn’t a contest where you really can “lose”. Come see these and the other semi-finalists’ pieces at www.landofodds.com, and vote your choice for the Ugliest Necklace, 2009. 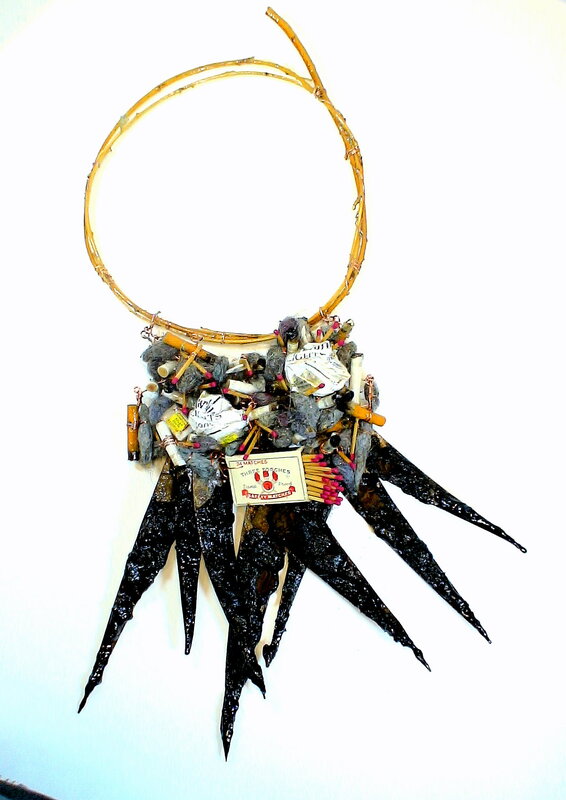 And if you are in the Nashville, Tennessee area, please stop by The Open Windows Gallery (fine art jewelry) at Be Dazzled Beads, where the 6 semi-finalists’ Ugly Necklaces are on display through September 15, 2009. The UGLY NECKLACE CONTEST (www.landofodds.com/store/uglynecklace.htm) is a jewelry design contest with a twist. The contest presents a challenge not often tackled — at least intentionally. The contest draws the jewelry designer into an alternative universe where beautiful artists create ugly necklaces. It’s not easy to do. This means that jewelry designers, if they are to create beautiful, wearable art, have to be more deeply involved with their pieces beyond “surface”. Or their pieces will be less successful, thus less beautiful, thus more disturbing or distracting or disorienting, thus more Ugly. Luckily, for the jewelry designer, we are pre-wired to avoid these negative things. This makes it easier to end up with pieces that look good. Beauty, in some sense, then, is very intuitive. On the other hand, it makes it more difficult to end up with pieces that look bad. You see, Ugly goes against our nature. It’s hard to do. Read the Contest Rules at www.landofodds.com/store/uglynecklace.htm . Entries accepted between 9/15/09 and 3/15/10. Land of Odds provides bead and jewelry making artists with virtually all their beads, supplies, books and jewelry findings needs, with over 30,000 products. Retail/Discounts/Wholesale.